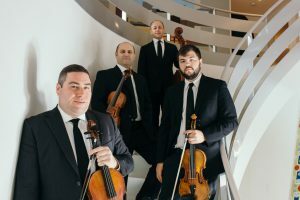 Miami Beach Urban Studios presents “Amernet String Quartet Rehearsal.” Join the Amernet String Quartet as they rehearse upcoming pieces for upcoming concerts here and around the world. 3:30 p.m. 420 Lincoln Rd. Details: https://bit.ly/2UIdmWa. Miami Beach Urban Studios presents “Vivid Viola Concerts: Mozart’s Great Quintets Part II,” featuring the Amernet String Quartet and FIU’s Ensemble-in-Residence Chauncey Patterson. 7:30 p.m. 420 Lincoln Rd. Details: https://bit.ly/2YVm2rm. Miami Beach Urban Studios presents “Miami Beach Viola Hangout as part of Miami Beach Culture Crawl,” featuring Michael Klotz for a fun-filled viola evening. Also joining, New World Symphony’s Piano Fellow, Thomas Steigerwald. 7 p.m. 420 Lincoln Rd. Details: https://bit.ly/2GaJj1a.